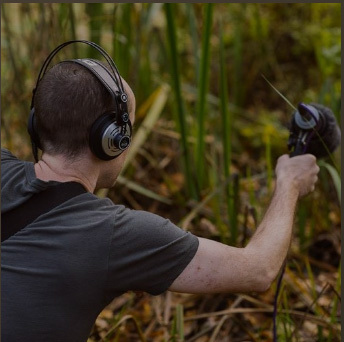 Nature Nurture goes High Tech with Soundmap! I am a Designer/Maker with a background in audio technology and project development. At the start of 2016 I was approached to collaborate on ideas and designs for an interactive showpiece for Tomorrow's Reading, part of Nesta's FutureFest programme. The process from conception to completion threw up a host of challenges and possibilities but it all started with a phone call and some serious brainstorming! In January on a chilly holiday in Brighton I took a call from Natalie Ganpatsingh (Director of Nature Nurture CIC). She was developing ideas for Intelligent Health in Reading and wanted my advice regarding fabrication and technical design. We bounced ideas off one another, working through the aesthetic and the practical possibilities and by the end of our conversation one in particular had begun to take shape- a tactile interactive map of Reading enhanced by bold graphics and user-triggered sound clips designed to draw people in and reveal the town in a different light. 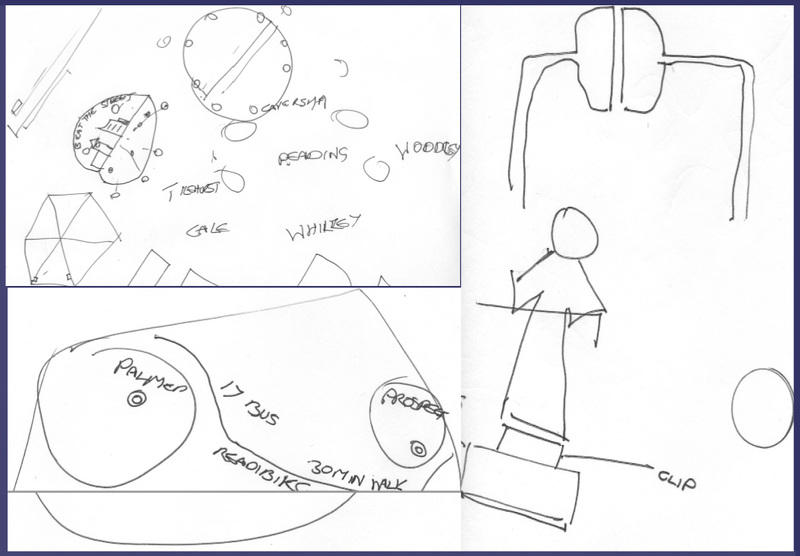 Here are a few of the sketches I made during our first brainstorming session. As soon as we got the green light from Intelligent Health this initial contact was swiftly followed by a meeting of the team which Natalie, as Project Manager and Conceptual Designer, had assembled to accomplish the task of designing and building the map. Richard Bentley - Location Sound Recordist/Sound Designer- would provide the sound clips captured around Reading, Richard Ganpatsingh - Digital Architect from HeathWallace - assisted by Zak (his son aged 10) would assemble and program the Raspberry Pi scratch computer and Scratch software and I would design the triggering electronics, audio integration and build the map from the ground up. We all collaborated on the interactive features and developing the look of the piece. Felicity Wehrle from Owl and Cat Design worked on the graphic side, integrating design elements and branding created by cream design. The durable map table surface was printed by Hobs Reprographics. On the way home from that meeting with a provisional deadline in place I sketched out ideas for how it could function and how to make it inviting, intuitive and interesting. The focus was on providing a means for people to re-connect with their hometown, their community and their local ecology while at the same time offering ideas and inspiration toward developing a healthy lifestyle. Beyond these key criteria the practical design needed to be modular and scalable with the flexibility to be extended and upgraded. We also wanted to make it as appealing and accessible as possible such that schools, community groups and the ‘maker’ community could benefit by utilising some of the ideas and innovations which came out of its development. Last but not least the whole thing had to be portable and tough enough to stand up to extended use in a range of environments. I first began work on prototyping the triggering system with 3 options emerging as the most viable- two conductive and one magnetic. After consultation we opted for a concealed magnetic switch using a wooden counter with an embedded magnet. Despite being a relatively simple concept the design is in the detail and the detail in the design. 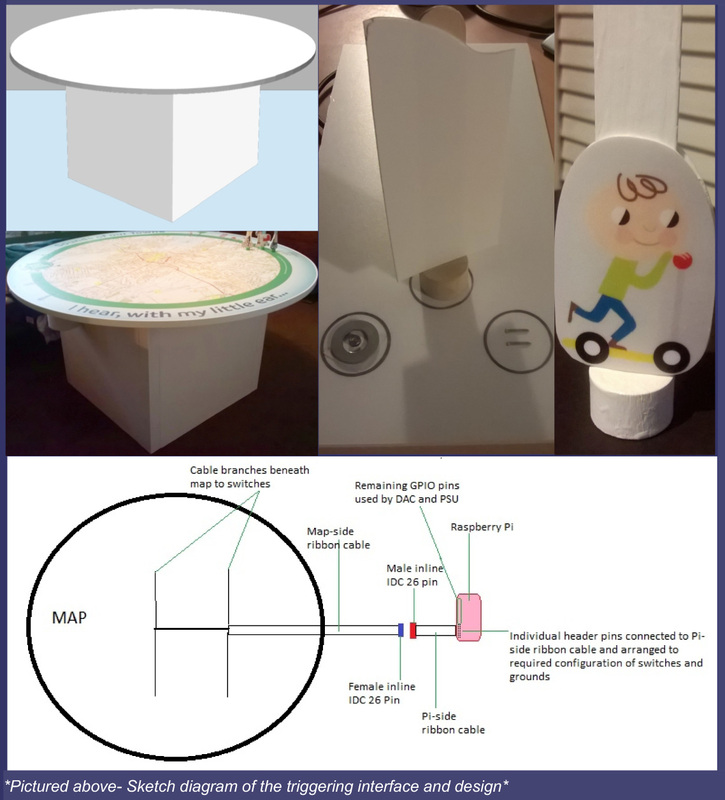 A good deal of testing and refinement was needed to select magnet and reed switch combinations which provided consistent triggering but would not activate adjacent points on the map or generate false triggering artefacts when interacting with the programming. Once the critical triggering mechanism was proven I moved on to the large scale design and material requirements. We sourced a basic table second-hand which I re-engineered to provide a rudimentary skeleton for the structure. Materials deployed in construction ranged through a variety of plastics, acrylic fabric, plywood, hardwood, softwood and a wealth of fixings, wiring and connectors. Almost all of it was sourced locally except for a few electronic components. The bulk of the materials purchased or on order I was then able to put together a simplified 3D rendering of the design. Perhaps it’s a cliché but as with most projects the key to making this work was maintaining good communication throughout. Not just to keep everyone updated but also in sync with each other’s progress. I exchanged regular correspondence with Richard G in particular on how best to interface the electronics with the Raspberry Pi and with Natalie on the evolving look and feel of the map. I divided the fabrication into stages however many of these stages overlapped as work progressed at different rates and new challenges or refinements cropped up. Once I had finished constructing and painting the supporting table I began to install the wiring (pictured below with help from Malachi the cat) and assemble the trigger modules (*Pictured below right*). At the same time I crafted the magnetic counters ready to attach to the printed characters. One of the final elements to be integrated was the sound system. Audio output from the Raspberry Pi was straightforward enough. High quality reproduction was essential but the speaker placement and orientation was also critical to create an accurate and effective soundfield for each user positioned around the map. With all the components and substructure complete the last stage was full assembly and cosmetic finishing followed by extensive testing and troubleshooting. Seeing it all come together for the first time was incredibly satisfying. A few minor tweaks were needed here and there but everything worked well and I put this down to good planning and a flexible iterative design process. To recount the story of the Interactive Soundmap’s design and fabrication in full detail would take up more space than I have here and probably bore most people to tears. Suffice it to say that from design, through development to delivery the project evolved and underwent progressive testing and adaptation to achieve the best results both aesthetically and functionally. 3 Responses to "Nature Nurture goes High Tech with Soundmap!" Thank you! The map you created was brilliant ! High quality print and durable…and great customer service as ever!